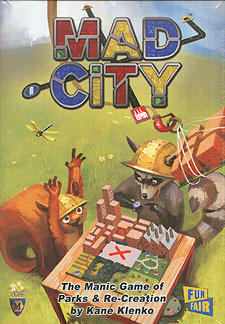 Welcome to Mad City, where we take zoning very seriously. We're just not very good at it. You are city builders racing against time, and each other, to build the best city. Frantically arrange your tiles in order to score your Residential, Commercial, and Urban areas. Do you dare to bet that your town is the greatest in order to earn some extra points? Or do you play it safe to avoid all risk? If you're an efficient builder and can wrap up your projects quickly, you'll earn bonuses for any parks and lakes in your city. Clear away the red tape and you'll be on your way to building an empire! Or at least a really nice city.